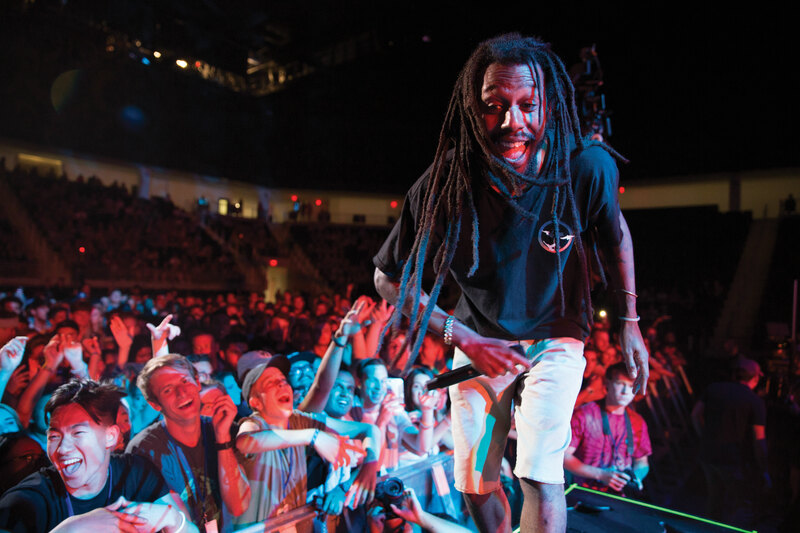 A free concert featuring Colony House, Propaganda and Grammy-winner Lecrae welcomed California Baptist University students to the new school year Sept. 4. The event was hosted by the office of New Student Programs and marked the final event of CBU’s annual “Welcome Weekend” orientation. This event was the first campus-wide event held in the Events Center in which construction was finished this past summer. The first 2,000 students to enter the event received a free Lancerpalooza T-shirt. Jay Stovall, director of New Student Programs, explained that what made this event different from past events is that it was open to all CBU students, not just first-time Lancers. The event was a success, bringing freshman through seniors together. Students began lining up to enter the event two or three hours before the doors opened. Colony House opened the concert with three songs followed by a set from Propaganda, featuring the artist’s emotional spoken word pieces and ended with a performance from Lecrae. During the last few songs of Lecrae’s set, he surprised students by bringing out singer-songwriter Tori Kelly to perform her part in Lecrae’s hit single “I Will Find You.” Bringing Kelly to the stage was the highlight of the evening for many students who attended the concert. Event staff did not know Kelly would be coming until the night of the event. Patrick Lau, sophomore civil engineering major, attended the event with a group of his friends. He said he enjoyed being able to see some of his favorite artists perform alongside his friends. The event was a highlight of Welcome Weekend 2017 and set the stage for the school year.